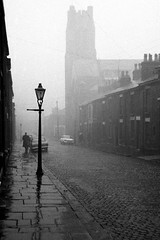 In December 1969, a young man from the south of England decided, under the influence of kitchen-sink films, to go to the North with his camera and capture the stark beauty of the old North on film before it disappeared forever. Some decades later, he got a Flickr account, scanned his photos and posted them here. Most of them are in black and white, and many are quite beautiful, in a somewhat bleak, sparse sort of way. 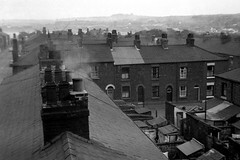 The photographs, which are generally beautifully shot, are accompanied by the photographer's descriptions of the scenes, in which he laments the passing of the old grim north, and the Southernisation of England, with the arrival of things such as pebbledash, holidays to Florida and even the Clean Air Act. Which does at times seem somewhat problematic; I suspect that the residents of Moss Side or St. Helens would quite happily sacrifice the bleak poignancy of their streetscapes for holidays in the sun and indoor lavatories (not to mention not dying prematurely from the effects of air pollution), though other pieces (such as this one about lost opportunities for childrens' play and this lengthy meditation on fleeting experience and the beauty in the mundane are simply sublime.